This blog, Café Unknown, is not so much about history as it is about place. Perhaps the difference is merely semantic, as for me the two are closely intertwined. Without continuity of place, a city loses its identity, it becomes a merely a collection of buildings, pipes and wires. For a person as historically minded as myself, this is self evident: Like that kid in “The Sixth Sense,” I see dead people -the ghosts of Portlanders past- all the time. Places, stories (and ghosts) all need continuity and context to survive (which is why so few new subdivisions are haunted). 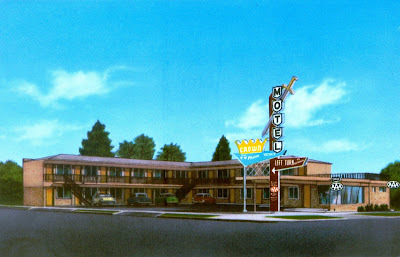 Portland’s character as a place is under constant siege. From high rise condominiums and row houses encroaching on historic residential neighborhoods, to the adolescent scrawl of the tagger or the Darwinian laws of business, the elements which make Portland are constantly being removed, altered or defaced. Music Millennium on Twenty Third Avenue, the Lovejoy Ramp, Quality Pie, Henry Ford’s Restaurant and the Church of Elvis are relatively recent additions to a long list which includes most of the cast iron fronted downtown, the jazz clubs and neighborhoods along Williams in Albina and the large portion of downtown slicked off in the 1960s for the South Auditorium urban renewal project. Keeping Portland weird was difficult enough. It is hard now just to keep Portland …Portland. Prescott’s going, why can’t Alberta? There is an effort now before the City Council to rename Interstate Avenue in North Portland to Cesar E. Chavez Boulevard. Streets lend a city continuity. Of colonial Nieuw Amsterdam nothing exists, except the warren of streets on Lower Manhattan. Just as important are street names. New York’s Wall Street is named for the city wall stood once stood upon it. Long after the personages whose names grace Portland’s alphabet grid (Everett, Flanders, Glisan, Kearney etc) have been largely forgotten (and in some cases miss-pronounced), their names have become part of our common topography. Beyond geographic functions, people live work and play along streets for decades, if not generations. Two blocks “off Interstate,” my new next door neighbor is a woman in her mid-eighties who recently moved back to the Overlook area to be near her son; he lives directly across the street in a house that she once owned in the 1940s. 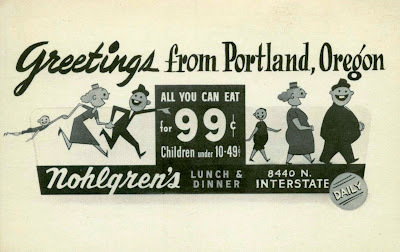 Much has changed in North Portland since then, but not the streets. They are part of a landscape of memory, both individual and shared. Broadway and Interstate circa 1940. 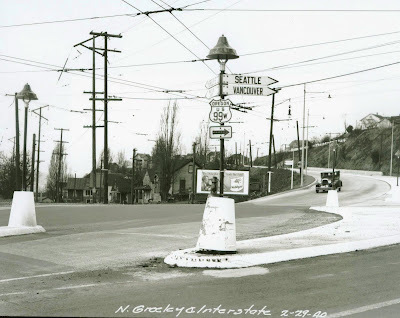 When Interstate Avenue opened in 1917, it started at Broadway, on the east side of the Broadway Bridge, and ran north through old Albina bordering neighborhoods of railroad workers; those of the Volga Germans in “Little Russia” and the Polish neighborhood, further up the bluff along the east side of Interstate near the St. Stanislaus Church. Directly across the street ,on the west side of the Interstate, was a largely Scandinavian neighborhood, many of whom which also worked for the railroad. 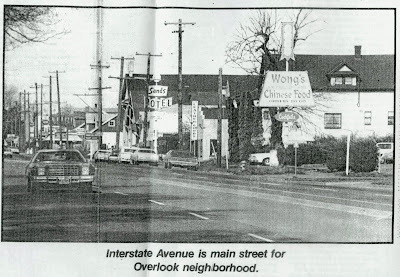 By the time the above photo was taken, the area around Broadway and Interstate was one of Portland’s earliest African American neighborhoods. The Portland Van Storage Building in the picture still exists. The neighborhood does not. It was demolished by the redevelopment for Memorial Coliseum in the early 1960s. Note the subway access to the pedestrian transit island in the middle of Broadway. 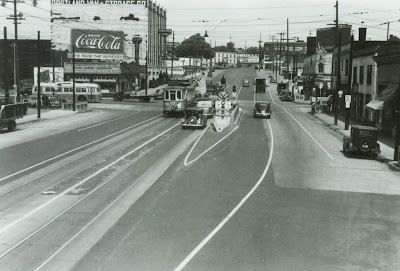 The electric bus (trolley coach) is on Interstate Avenue (Interstate was lowered and brought closer to the river then extend south during the Memorial Coliseum redevelopment. The old alignment in now part of Larabee Avenue). The MA sign on the streetcar stands for the Mississippi Avenue line. Street re-naming in Portland is nothing new. With the consolidation of Portland, East Portland and Albina in 1891 many streets were renamed to avoid duplication. 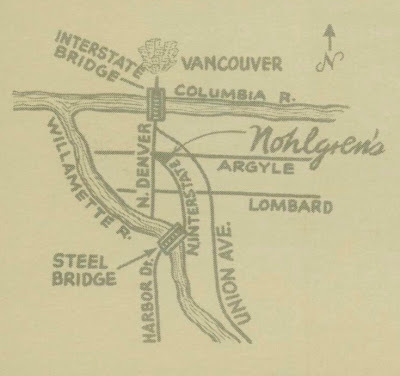 Interstate Avenue was created by connecting a series of streets between Lower Albina and Kenton in 1917 to provide a route to the new Intestate Bridge. Many German names were removed during World War I. The street re-numbering plan of the early 1930s (which divided Portland in to North, Northeast, Northwest, South West and South East sectors and added the convention that streets ran east to west and avenues north to south) brought another wave of re-naming. Changing names of long established streets to honor admired personages however is a relatively recent phenomenon. In 1989 Union Avenue was re-named for Martin Luther King Jr. In 1996, in a staggering outbreak of historical amnesia, Front Avenue, the very street where Portland was born, was renamed Naito Parkway to honor businessman Bill Naito. Last year, Portland Boulevard was changed to Rosa Parks Way. To fight these strictly elective alterations to Portland’s character is difficult, if not impossible. It requires the willingness to go up against an organized opposition with motivations that in themselves are honorable. It requires playing catch-up in a shadowy process whose rules are altered at the whim of City Councilors. Who has the time and energy to mount opposition, especially when examination of the process that lead to Rosa Parks Way concludes that the fix was in from the moment Commissioner Dan Saltzman decided that it was to be? And finally, who would want to take on Rosa Parks? 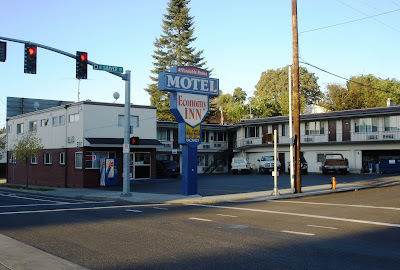 By 1940, Interstate Avenue hosted a portion of US Highway 99W. The photograph above is looking north, where Interstate Avenue climbs the bluff. “Stringtown” the houses along east side of Greeley, next to the Albina rail yards, is to the left. It is the perception that opposition to the renaming a street is the same as opposition to honoring a person, which is the biggest obstacle to those not in favor of re-naming. Allow me to state, in the clearest most concise terms possible; I have no argument against honoring King, Naito, Parks or Chavez. In the case of Rosa Parks, the demolition of the “Bill Roberts Transit Mall” (a.k.a. the bus mall) was a sufficient break in continuity to have allowed the new transit mall that replaced it to be named for her, with poetry that hardly needs to be stated. It was a opportunity mind-boggling to have been missed. A like suggestion by John Wylder, in the Oregonian’s Commentary page from September 8 2007; that a new farmers market for Portland be named for Cesar Chavez, has similar eloquence. Both ideas are additions to the character of Portland, without subtraction. But if street re-naming is the only way to honor a personage, perhaps a solution, where a numbered street is appended with a name, such as with New York’s Sixth Avenue also being the “Avenue of Americas" could work. Once again, it is addition without subtraction. For make no mistake about it, when a street named is changed through political means, something is being taken away from somebody. The issue goes beyond Interstate Avenue. It is reasonable to assume that other groups will have their own heroes they would like to see honored. For what it is worth, the city code states that the City Council is allowed to change a streets name only to correct errors and eliminate confusion. A similarly ignored portion of the code allows street name changes only with a citizen based process that includes a petition and a panel of historians. Interstate Avenue in the mid-1970s, looking east from Overlook Park. Much of this area is now part of the Kaiser complex. The sign for the Alibi is visible in the distance to the right. With the city code arbitrarily disregarded, who decides that one group’s hero has more merit than another? Is there any reason to believe that re-naming will be restricted only to civil rights heroes? If honoring minority viewpoints and voices is truly paramount in Portland, then a Ronald Reagan Boulevard is an inevitability. Meanwhile Portlander’s cynicism with process will grow. And what other long established Portland street names will be lost? 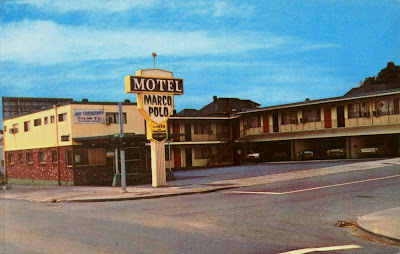 The Marco Polo Motel, circa the 1960s on the corner of Interstate Avenue and Shaver, when Interstate Avenue hosted a portion of US Highway 99W. Another view, circa 1939, of the area around Interstate Avenue and Greeley. Interstate veers to the left as it climbs up the bluff. The street to the right is a long vanished segment of North Michigan Ave now buried beneath the earthworks that support the I-5 approach to the Freemont Bridge. 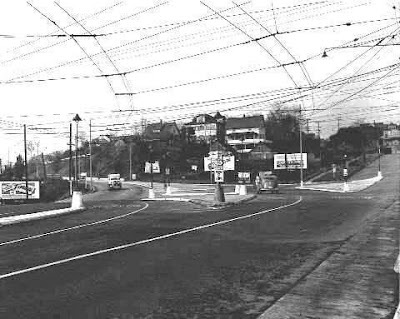 The (double) wires for the Interstate trolley bus (trolley coach) line are clearly visible. Greeley and "Stringtown" is to the far left of the billboard, just out of the picture. Courtesy of the Salem Public Library. 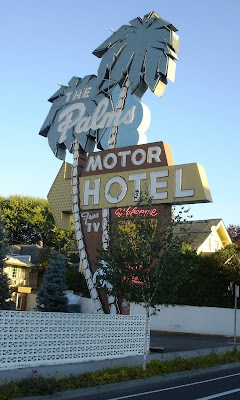 A Portland Landmark? No problem, just plant a tree in front of it. It is not like its going to grow or anything. The next post will be entirely non-issue driven. To Eugene Snyder, author of "Portland Names and Neighborhoods".